San Francisco is a large city squeezed into a tight 47-square mile space, and many of those living in and visiting the city decide to forgo using a car to get around for many reasons. Not only is parking nearly nonexistent in many popular areas of the city, but it can be expensive as well. However, the public transportation options are varied and extensive for those traveling to and throughout this beautiful city. And nearly one out of every three residents in the city use public transportation to commute to work, a percentage that ranks the city third in the United States. BART (Bay Area Rapid Transit) is a mostly subway system that sends four of its five lines through the city. Although a significant percentage of the system is above ground, the vast majority of the tracks in San Francisco are below the surface. Trains going east head into the four-mile Transbay Tube and to Oakland and the East Bay. The four routes then terminate in Richmond, Bay Point, Dublin and Fremont. Trains heading south travel as far as Millbrae. Caltrain is another rail service that serves San Francisco. Its northern terminus is a block from AT&T Park, the home of the San Francisco Giants that is located a short distance from downtown. Trains travel to and past San Jose as far south as Gilroy. There are three stops located within San Francisco, all on the east side of the city. Muni (San Francisco Municipal Railway) is the seventh largest transit system in the country as it provides more than 210 million rides a year. It runs 54 bus lines throughout the city, and very few people in the city are ever more than a few blocks from a bus stop. There are also 12 overnight routes for those staying up late or getting a very early start on their day. One of these, the 91 Owl, has a 24-mile route, the longest in the system. The 29 Sunset is the longest daytime route at 17 miles. The organization also operates Muni Metro, a light rail system that serves downtown and several other areas of the city. It generally operates underground downtown and above ground away from downtown. There are six routes. Two head to within blocks of the Pacific Ocean on the west side of the city: the N Judah and the L Taraval. Muni operates a heritage streetcar line, the F Market & Wharves, and three cable car lines as well. 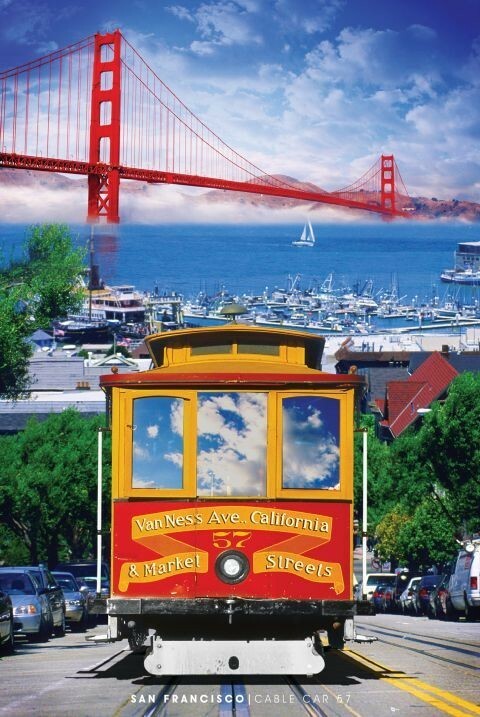 Its cable car system itself is a popular tourist attraction. Three other bus-oriented public transportation systems serve San Francisco: AC Transit, SamTrans and Golden Gate Transit. AC Transit mostly operates in the East Bay, SamTrans provides service south of the city, and Golden Gate Transit serves the communities located on the other side of the Golden Gate Bridge north of San Francisco. Those traveling to San Francisco have three major airports to choose from: San Francisco, Oakland and San Jose International Airports. Travelers may take BART trains into the city from the San Francisco and, with the assistance of an AirBART shuttle bus, Oakland airports. A free ride on the Airport Flyer bus from the San Jose airport transports travelers to Caltrain’s Santa Clara Station for a train ride north into San Francisco. Other options for those traveling into the city from outside the region include Amtrak and Greyhound. Trains arrive across the bay in Emeryville, and Amtrak Thruway buses provide direct transportation from that train station into the city. San Francisco’s Greyhound terminal is located downtown, two blocks south of Market Street. Lexy Mulheim wrote this article for www.sanfranciscohotelguides.com. Lexy is a freelance writer with experience in many different areas but enjoys writing about travel and San Francisco.